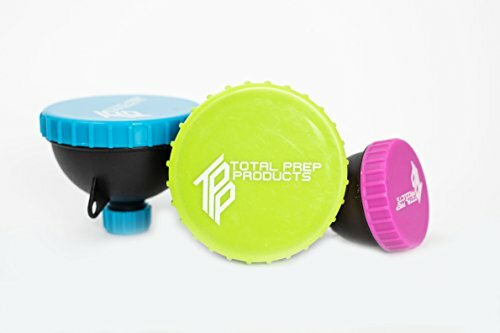 Are you tired of every time you go out to bring a whole can of protein powder, milk powder or bring the whole box of pills，our protein powder funnel can easily solve your troubles!It allows you to put 3-5scoops of protein powder into one of these funnels and carry it with me wherever I go.Convenient, portable, easy-to-use, it is the best way to take your supplements with you anywhere. 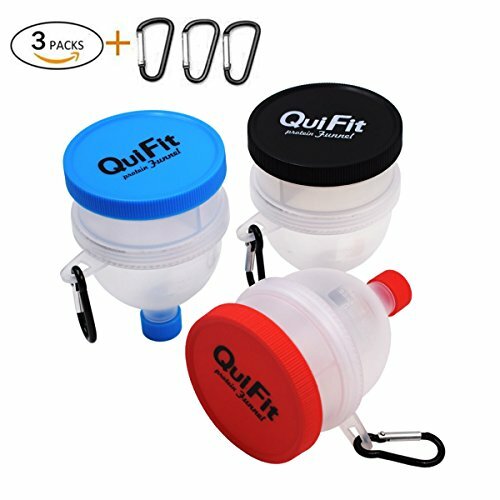 This patented dual screw cap funnel design allows you to fill and carry a serving of your favorite supplement powder when you're on the go.Capacity: 120 ml (equivalent to about 30 g protein)Material: PP/PEColor: sky blue-Powder supplement division Portable funnel!-Pour the powder directly into the plastic bottle and just shake it!-You do not have to carry a shaker.-Can be carried by subdividing powder supplements.-Just open the bottom cap and pour it into a plastic bottle-Stylish and presence color-BPA-free and contains no toxic substances.-Available for dishwasher (heat resistant temperature: 80 ° C or less)TIPS:- Please be careful not to lose the upper and lower caps.-Wash thoroughly, please use after completely drying.-To prevent children from accidentally swallowing, Please keep the cap in a place out of reach. 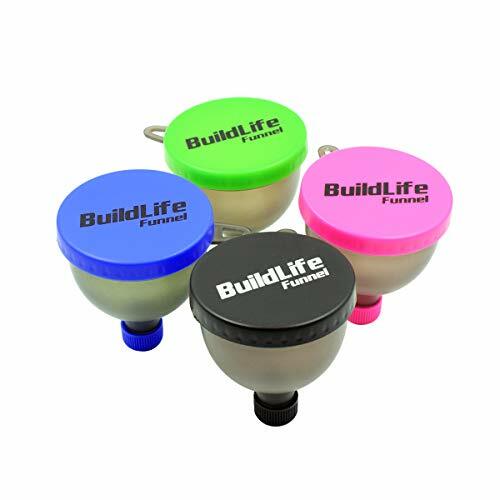 Product Details: BuildLife Funnel Protein Powder and Supplements Portable Container BPA-Free Plastica Can hold up to 100g of powder and supplementsUse with protein powder, post-workouts, pre-workouts, drink mixes, etc. 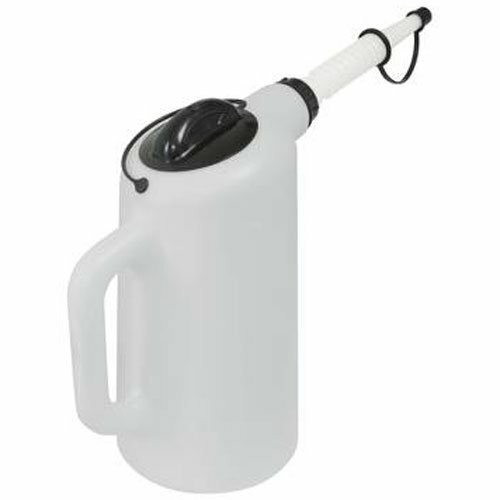 Easy-to-use, easy-to-clean Fits all standard-size water bottles100% MONEY BACK GUARANTEE Ensures this will quickly become your favorite no-risk purchase.Many people are stocking up with 3 or 4 of these so everyone in the family has one. HURRY AND BUY NOW while we have this very popular workout funnel in plentiful supply. This a great birthday present,holiday gift, or anniversary gift. Wonderful for friends, family, and co-workers. Tired of messy bags of powder leaking in your gym bag? Us too! That's why we decided to make these awesome time-saving funnels! 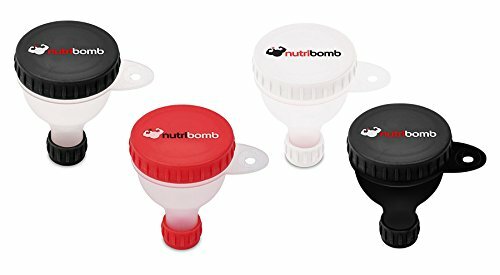 Great for traveling or on the go, these funnels take up barely any space and store and easily dispense your supplement into a water or shaker bottle. No more spilling powder everywhere as you try to dump it out of a bottle top or bag. The convenient 3-pack means you can bring all your supplements with you for the day! 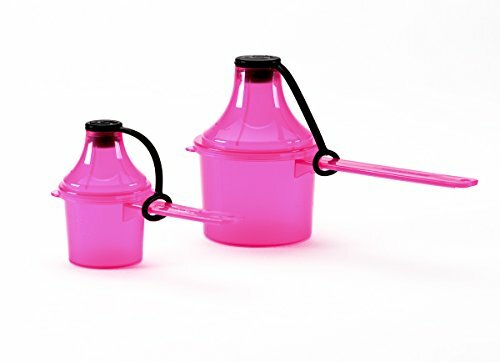 We love these funnels so much, that we are backing them by a 100% satisfaction guarantee. If you don't love them, give us a shout! The two bigger funnels are the same size (The blue and green lidded funnels) fit just over 1/3 cup or about 3 oz into the larger size funnels. With the smaller funnel (the funnel with the pink lid) fit 1/4 cup or about 2 oz into the funnel. 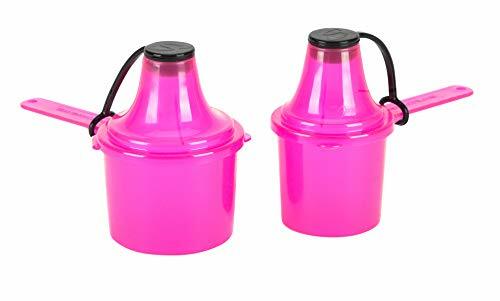 Having trouble transporting powder supplements and baby formula into bottles? Look no further! 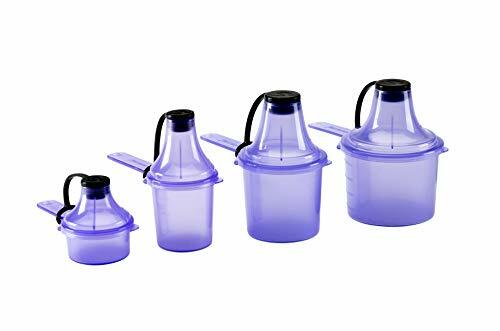 The Scoopie is a versatile and portable scoop and funnel container that moves your favorite powders from container to bottle, mess free, while also acting as a culinary measurer. The details: Simply scoop, snap, flip and pour. The Scoopie not only eliminates messes and spills, yet also saves you time and money by keeping your supplements and formula in the bottle rather than on the counter or floor. Say goodbye to your scooping headaches! Simplify gym and baby bag prep. Easy scoop and funnel design. 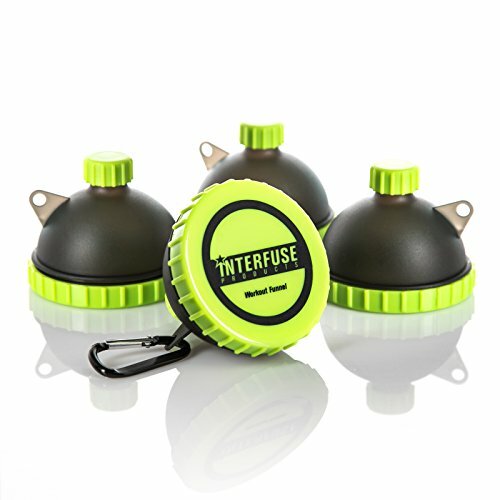 Can be used as portable on-the-go carrying device. Travel friendly. Measure goods in cc/ml and TBSP. Makes a great fitness buff gift. BPA free. FDA approved plastic. Dishwasher safe and food friendly. 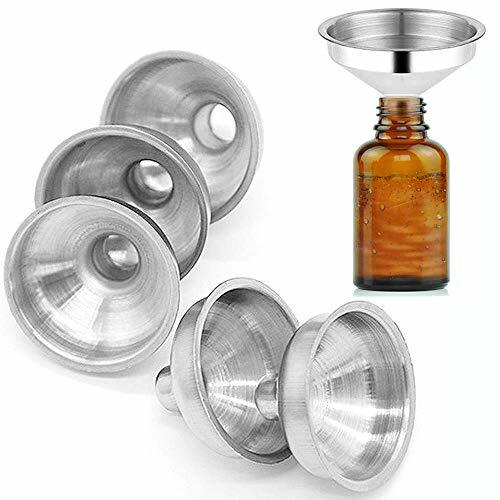 Describtion: Package:Pack of 6 Material: stainless steel Size: 3.6*3cm Easily transfer your essential oils into smaller dispensers Easy to clean and store,this mini funnel keeps waste to a minimum when filling narrow jars and cans. Our set of six (6) stainless steel funnels are made to fit all of the bottles sold by Coolrunner. They are perfect for portioning your essential oils into smaller containers without all the spills. Additionally, these funnels are made to fit into most types of drinking flasks - please check yours to ensure that the opening is at least 9.5mm wide. As with any product, please wash before use.